Today, we are with Baba Fashionista with Fabric Flavours and we are treating you with another giveaway for a chance to win a babygrow of your choice. I hope you all had a good week. I started working again on Wednesday and it’s been a busy time for me. Overall, both Baba and I survived all the changes. It feels like I never left my job. To my surprise, I was quick to be back into it. And Baba enjoyed being at the nursery too! Hurrah! To celebrate this Frenchie victoire, let’s treat you to a little something! Ready? I am very excited to feature Fabric Flavours in Baba Fashionista. If you are a fan of comics, superheroes or just cool movies like Star Wars, this brand is parfaite for you! Fabric Flavour offers fun and innovative clothes not only for children but also for adults. If like Grumpy Boyfriend, your other half is into Batman, Superman and other heroes, check their website. Fabric Flavours is a London based, creative showroom that supplies some of the most famous department stores including Selfridges, Liberty, Harvey Nichols, Fenwick, Melijoe, Alex & Alexa, and Harrods to name a few. Isn’t cool? Their collections are diverse: Doctor Who, Gruffalo, Marvel, Minions, Mr Men, Superman, Tom and Jerry. There is something for every taste here. Everything has a fun print on and a touch of humour! I am delighted to feature such a unique brand in Baba Fashionista this week! Look at the items we received for this review! They are just perfect for mon petit homme! As soon as I had to choose some items for the review, I knew I had to select one with a superhero. Grumpy Boyfriend is a big DC Comics and Marvel fan. He also loves Star Wars. Believe it or not but our last romantic evening without Baba involved a quick kebab before going to the cinema to see Rogue One! Romantique non? ? Baba has already a lot of clothes with Star Wars’ characters on it. I can’t resist when I see some in a shop and I know that my partner will always love it. Batman better watch out! Frenchie Batman is in town! Yes, you are not dreaming! Baba is on his papa’s lap. 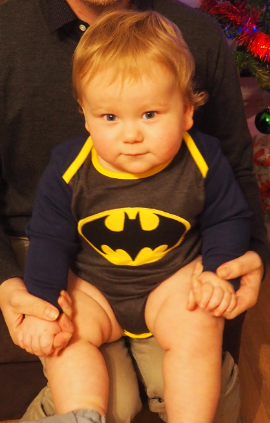 This Batman onesie is so lush! With the famous Dark Knight logo on it, my Baba turns automatically into a Frenchie superhero! The dark grey and navy colours are the perfect match and the yellow binding at the seams is a great reference to the comic! The little detail that makes this onesie special? There is a secret message hidden on the inside of it! How funny is that?! The second item we received is celebrating another classic in my opinion. I loved Mr Men when I was a child and Baba already has a set of books (in Frenchie) that we use for our bedtime routine. 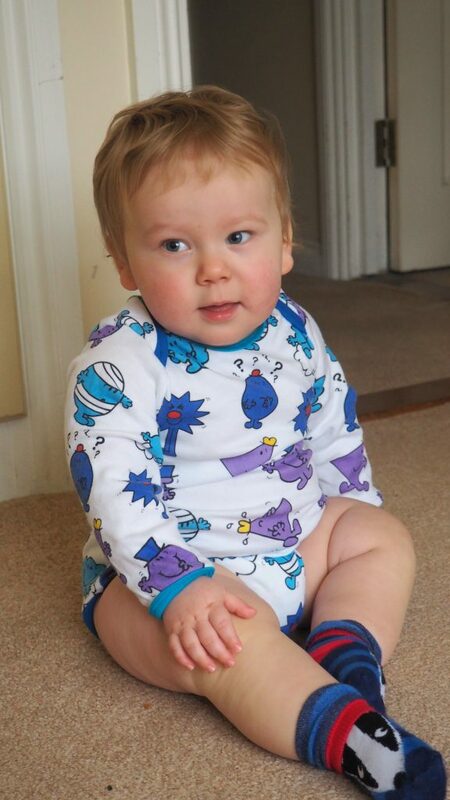 It was easy to choose this babygrow as the colours are so bright! Funny enough, this onesie also represents so many different factors of a child’s personality. It is covered in fan favourites such as Mr Bump, Mr Rush, Mr Sneeze, Mr Forgetful, Mr Daydream, and Mr Impossible. A good mix for Baba as he is definitely a bit of all of that! The pattern is simply fun and coloré. I also loved the fact that it was so easy to match it up with Baba’s clothes. It would go with anything! Fabric Flavours‘ clothes are bright, full of energy, fun and so cool! I had so many compliments every time Baba wore those too onesies. If you want your little one to be part of the cool gang, this is the place to visit. Not only the clothes are unique but they are made of very good quality! The fabric is perfect for the season and I have no doubt that mon bébé keeps warm when he is wearing them! I also love the choice Fabric Flavour offers. You can for sure find something to make your little ones or your other half happy. So head over to their website now for a cool and not expensive present that will make someone happy today. ? I hope you loved reading Baba Fashionista with Fabric Flavours! That’s all for today! Off to meditate for now! Being a superhero is tiring! In love with this fabulous brand? 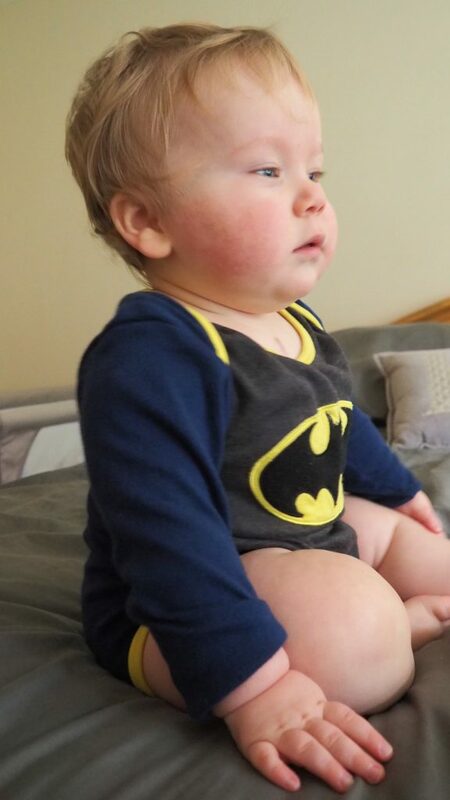 Then, enter the giveaway now for a chance to win one of the onesies reviewed in this post! Are you a Batman or Mr Men fan? Enter our Frenchie Competition with Fabric Flavours via Gleam below. Only one entry is needed to enter the giveaway, but the more times you enter, the greater your chances of winning! This giveaway starts tonight at 7 pm and ends at midnight on Monday 30th January 2017. UK entrants only, please. Bonne Chance! Disclosure: we were kindly provided with those clothes by Fabric Flavours for the purpose of this review. All opinions are my own. And yes, Grumpy Boyfriend is a big boy deep-down, like a lot of other men out there? ? Fab giveaway! Gorgeous and so cute! Great giveaway – great range of clothes for boys. Incredibly cute! Would be delighted if I won. LOVE the Mr Men one, super cute! Fab! I’d love one for my own little superhero! I wish I would have known about these when my daughter was small! I think one would make the perfect gift for someone I know who is having a baby. The Mr Men one is so cute. Love the Mr Men design. These look fun! and relate to characters they can identify. I really love these; such fun and unique from the run of the mill. I love these- if only they came in adult sizes too! this is awesome!! how cool! What a super giveaway. Super cute and cool outfits. Thank you for linking up to #EatSleepBlogRT ? What a great range! Lovely to see something a bit different. Aww! You’ve chosen some super cute baby vests! What gorgeous things! Love them – Mr Men one is super cute. these are great ideas – i am a nanny in waiting!!! to a little boy!!! Love the little onesies – I think the second is my favorite with a white background blues in the print. Aww these look fab! You have a fantastic little model there too. I’ve entered! So cute, fab funky and bright ! Wow! These are fab ????? Well I am sold! My girls may not like Batman and Hubby may not understand my love of Star Wars but these are right up my street! I want one! Unfortunately my birthday has just passed so I am wondering if I can sneak buy something without anyone noticing…..? These are absolutely fabulously funky! 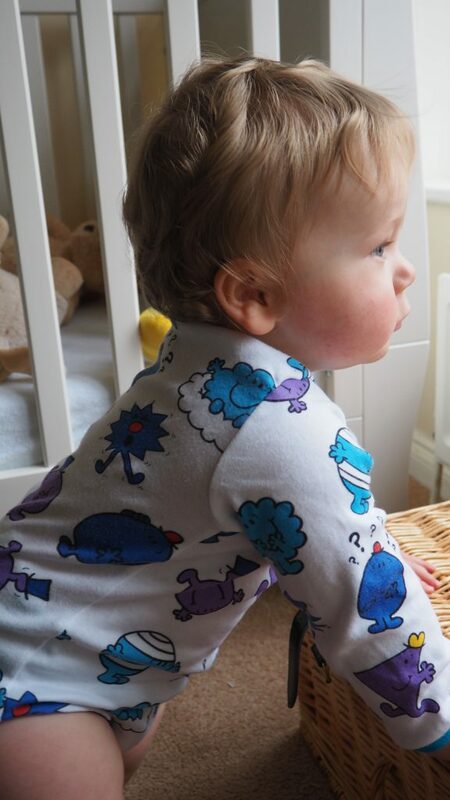 I will definitely be placing an order to some super cool babygrows! Lovvely things…. don’t know how but you asked me to comment on my husbands work, very strange. These are amazing. Would go for minions. As a family we love the series of films. 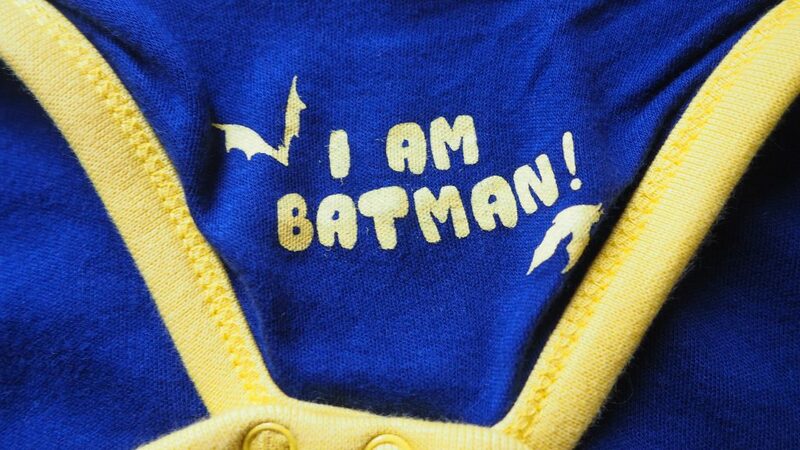 i love the batman one, your littlie is cute! Previous Previous post: 12 photos,12 histoires: one year with Baba!